Parents John Branch and Rosemary Hall savored that moment on the New Jersey army base, marveling at the event and reflecting on the obstacles and challenges that brought their son up to this cherished moment in time. When Westwood High School graduate Kevin Branch was promoted to colonel – or “full bird” for the Army nerds – in the U.S. Armed Forces on Jan. 11, he was extremely grateful that both of his parents were able to do the honors of pinning him at the ceremony. At that time, the elder Branch feels that he had good reason to watch his son more closely to make sure he didn’t get into trouble. Kevin Branch also admits that he never wanted to get caught up in any drugs or gang activity growing up. He wanted to make something of himself. Before graduating high school, Branch received the highest award in JROTC, the JROTC Medal for Heroism from the commanding general of the U.S. Army Cadet Command. 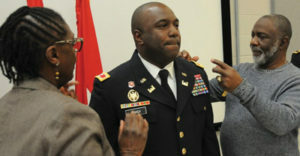 Branch attended the University of Arkansas at Pine Bluff and was commissioned as an army field artillery officer in 1998. He later transferred to the Army Engineer Branch in 2007, where he currently serves as director of public works and regional engineer for the 99th Division (Readiness). An impressive civilian education includes a Master of Defense Studies from the Royal Military College of Canada; a Master of National Security Strategy from the National Defense University; a Master of Science in Mechanical Engineering from the University of Missouri at Rolla; a Master of Science in Engineering Management from the Missouri University of Science and Technology, and a Bachelor of Science in Physics from the University of Arkansas at Pine Bluff. He is also a graduate of the Chrysler Manufacturing Academy and World Center for Concrete Technology, Executive Session. Branch’s military education includes the National War College, Army Command and General Staff College (CGSC), and the United Kingdom Intermediate Level Education (Ground) Exchange Program. His awards include the Bronze Star, Afghanistan Campaign Medal, Iraq Campaign Medal, the German Armed Forces Proficiency Gold Badge, and many other commendations. He is a recipient of the National War College 2016 Department of Homeland Security Award for Excellence in Research and Writing and holds the distinction as being the first National Defense University North American Aerospace Defense Command/U.S. Northern Command Scholar. He is a member of Alpha Phi Alpha Fraternity, Inc. Branch is married to Alecia Thompson-Branch, an attending neonatologist at Montefiore Hospital and assistant professor of neonatology at the Albert Einstein School of Medicine in Bronx, NY. They have two sons, Ethan, 2, and Emerson, seven months.